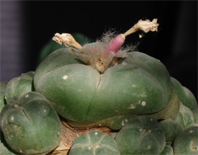 How soon after your Lophophora flowers can you expect a fruit? I was asked this question in a comment a while ago. 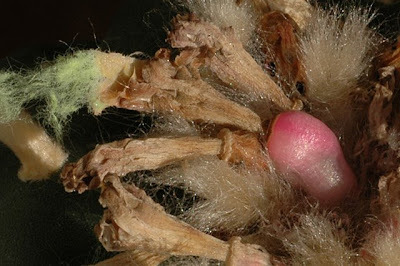 I could not give an answer that was more precise than flowers pollinated early in the growing season would set fruit later the same year so I decided to investigate the question further. 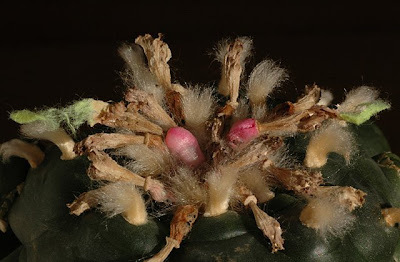 Friday July 18 I marked 5 freshly pollinated flowers on my grafted Lophophora williamsii (SB 854; Starr Co, Texas) with yellow pieces of cotton - the cotton was attached to the spent flowers using nail polish. The flowers were all pollinated 1 and 2 days prior to being marked. All I had to do now was lean back, relax, and wait for the fruits to pop out. 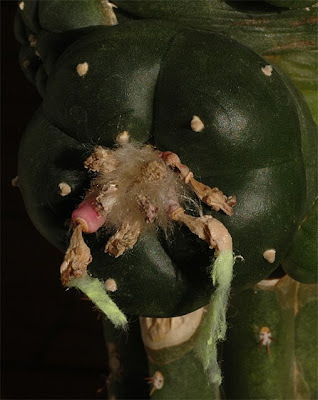 Wednesday September 10 – less than 8 weeks after pollinating the flowers – all 5 fruits had appeared. The first fruit (in the right hand side of the photo below) appeared more than a week earlier than the others and consequently looks a bit withered. 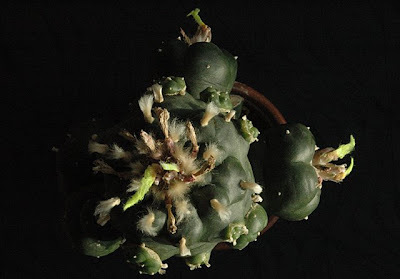 So a more precise answer to the question above is that you can expect your Lophophora williamsii plant to set fruits within 7-8 weeks after pollination. At least that is the case for a grafted plant in good growth.